The moment it starts feeling a little chilly, I start looking forward to Christmas. I don’t think I’m alone in starting my Christmas planning, if the memes going around Facebook are anything to go by! Once the kids are back at school, I like to book festive treats for the family, as in the past I’ve left it too late and been disappointed. 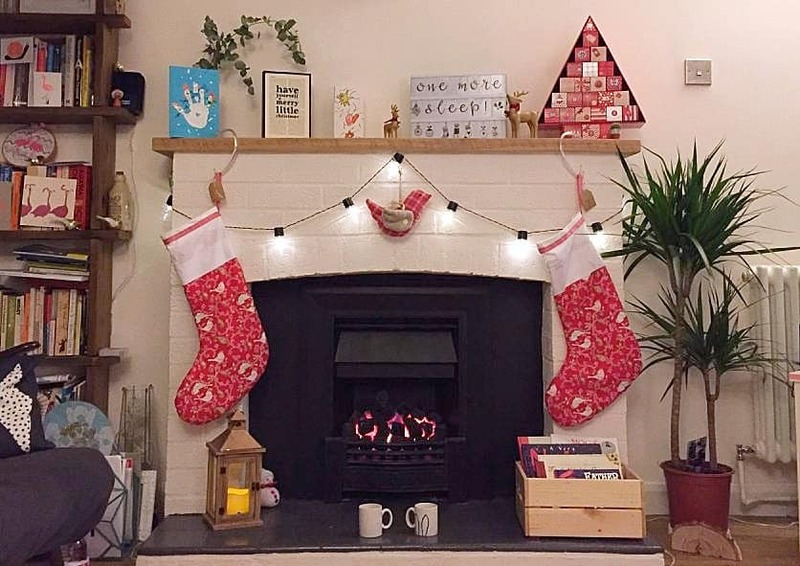 So here is my Christmas planning list, it’s localised to the Bucks area, but hopefully it will give you ideas of some things to book in your own area. Arguably the most important Christmas planning event, booking to see Santa is a hot topic on the mum forums! In Milton Keynes, probably the most well known Santa is at Frosts Grotto in Woburn Sands. Tickets for their Father Christmas experience are already out and the weekend ones tend to sell out quite quickly. I have never taken my girls to Frosts’ Father Christmas so this year may be the year! I have been to their other seasonal events in the past, and they are always good, though on the more expensive side. Cost: £39.96 for two adults and two children. You can book Frosts Santa’s Grotto here, they also have garden centres in Wellington, Brampton and Millets Farm. 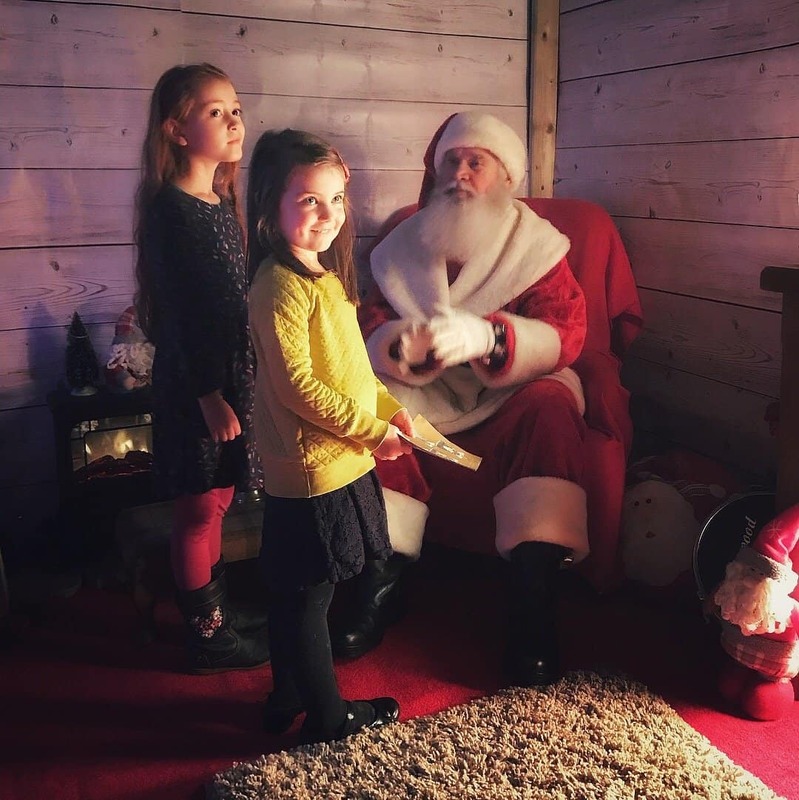 Last year we went to the Dobbies Grotto, which was really wonderful, and the girls loved chatting to Father Christmas in his cabin. They chose Sylvanian Family toys which went down a treat. Cost: £23.98 for two children, no charge for adults. You can book Dobbie’s Santa’s Grotto here, and they have multiple garden centres around the country. 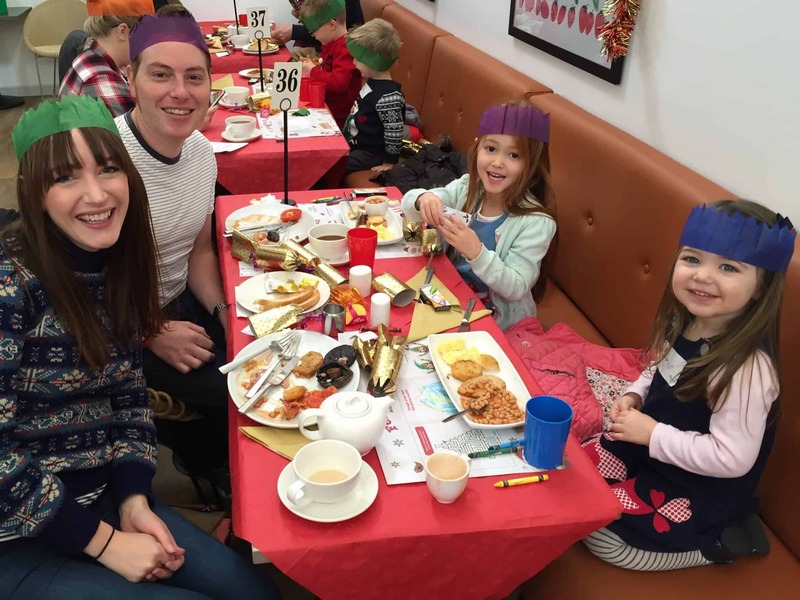 Dobbies also have Breakfast or Tea with Santa experiences, which include a toy and a meal. Check out Thea’s squidgy little face, so cute! I haven’t been to the Wyevale Santa’s Grotto but a few years ago we had Breakfast with Santa at Wyevale Garden Centre in Woburn Sands. It was really cute but lacked some of the magic of Dobbies or Frosts. My husband and I really enjoyed the fact that we got breakfast too! Cost: £12 for two children, no charge for adults. You can book Wyevale Santa’s Grotto here. They also have garden centres across the country. Wyevale still do their Breakfast or Tea with Santa too, if you’re interested in that option. A few years ago, we went down to World’s End Garden Centre, near Aylesbury to go to their grotto. My husband was very reluctant to travel for an hour to go to a garden centre, but luckily, it turned out to be the perfect way to get into the Christmas mood. You walk around animatronic scenes, full of cute details and characters. It has a different theme each year, but when we went it had a story book theme. It’s pretty low-tech, and I wonder if they have bought up the displays from shopping centres in the 80s and 90s – it has a real nostalgia about it. 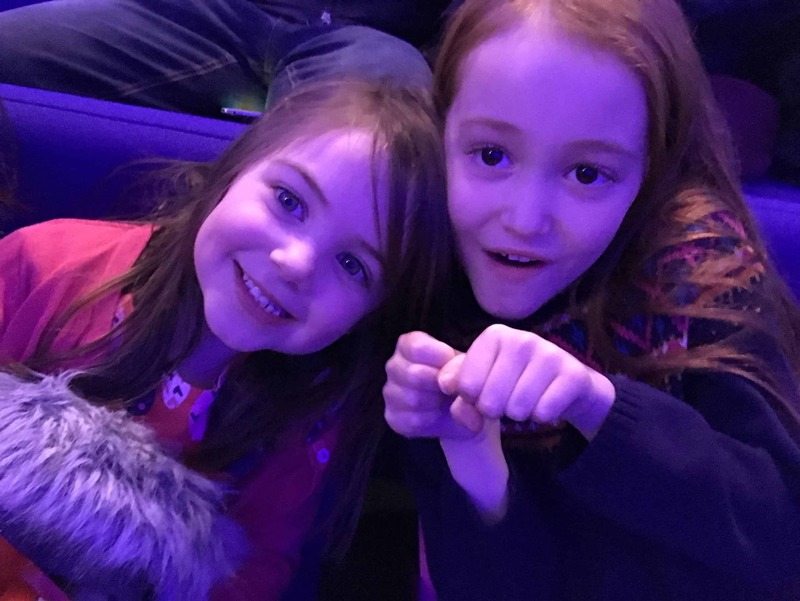 Our girls loved it and it was not expensive, and you can read all about Winter Wonderland on my blog post here. There is a Santa there too, but we didn’t visit him. You can’t book ahead, so just go along and hope it’s not too busy! You can find out more on their website here. Do you have a good pants near you? We took the girls to one of our local pantomimes last year, and they loved it. We didn’t go to the main one, but chose an amateur production and it was really good fun, and a lot cheaper. We’ve booked the same one for this year and are looking forward to seeing the girls’ reaction again. 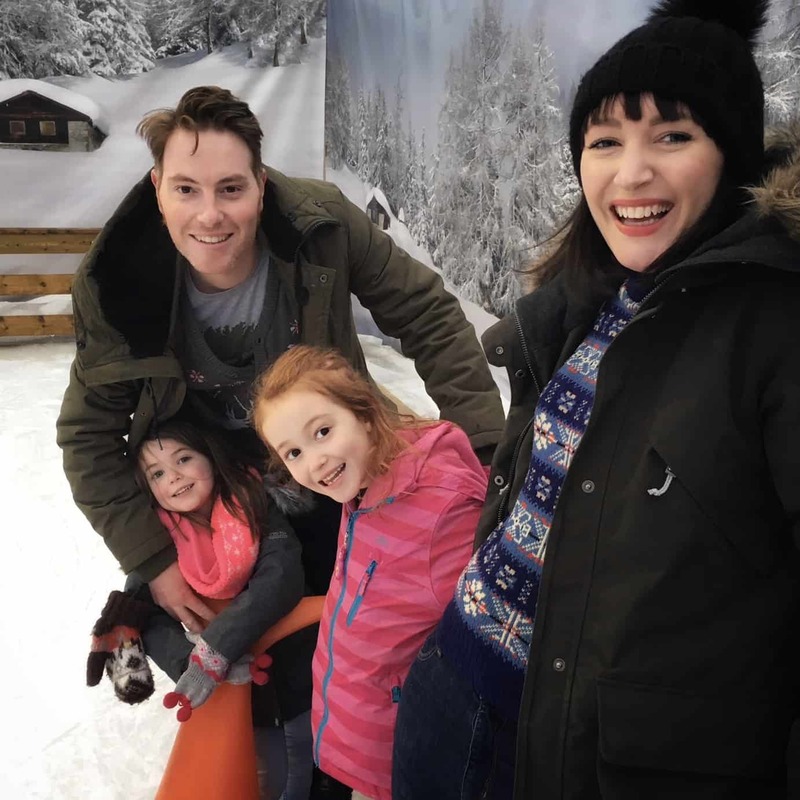 How about a bit of ice skating to get you into the festive moon? We took our girls last Christmas eve for the first time last year and it was hilarious. 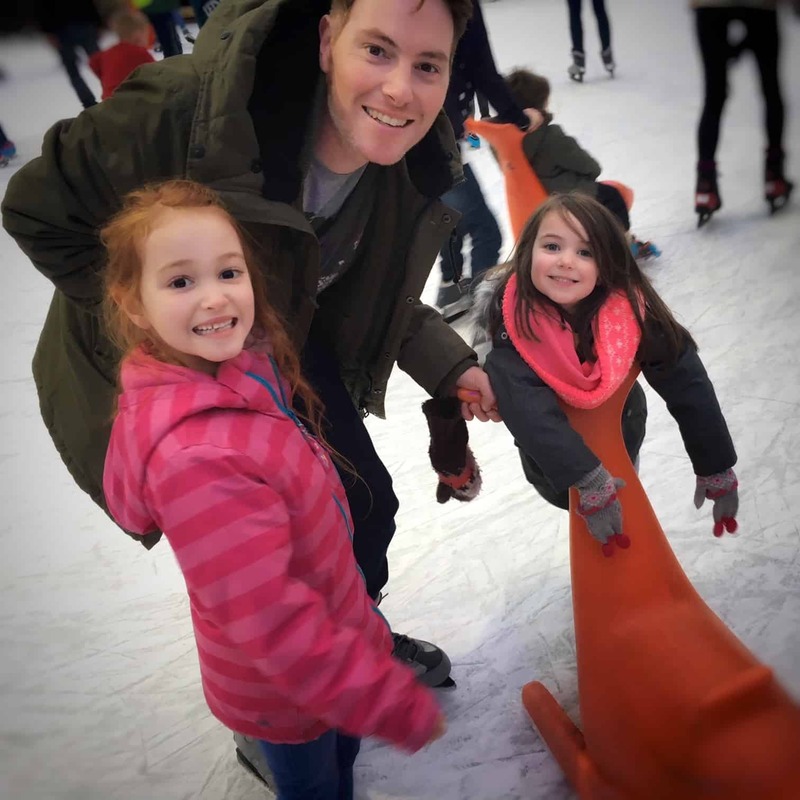 My husband Ryan, and Ava and Thea are all really good at skating. I am terrible. There is a video of me ‘skating’ and it actually looks like it’s in slow motion. It’s not. This year, I think I might just watch. Every year, we make up a shoe box of little gifts, which is sent to a developing country to a child who would otherwise receive nothing. Apart from being fun for the girls, it’s a great way to help them appreciate how lucky they are, and to help others. You can read about what we’ve put in our box, and see a lovely video of some of the kids receiving their gifts, in this post below. One of the highlights of the Christmas season for us is a visit to Waddesdon Manor, also quite near Aylesbury. They decorate the manor house and ground in the most beautiful way, and have some kind of outside light event too. Last year they had brilliant projections on the house, and previous years have had light installations in the grounds. There is also a lovely Christmas market running earlier in the season, so it’s a great day out. You can read more about it on my post from last year by clicking on the link below. This is one to book ASAP as the house time slots get booked up well in advance. Every year I like to add a Christmas book to our stash. We love a Christmas story in this house! These are my favourites. I am a little wreath crazy. Last year made this pink toned wreath at a workshop, and you can read about it below. I was so proud of it, and it lasted really well through the Christmas season. There are plenty of places you can make a wreath in the Milton Keynes area, and I really enjoyed it so will be doing another. If you want to make a simple home made Christmas wreath, I did a tutorial here, which is so quick and easy, yet looks great on your door. Last year, I also made Winter Wreaths, which go on wall inside. They were also super quick and easy to make, and looked great for months. In fact, we still have them up on the wall as they have dried out really well. I hope you’ve found my Christmas planning list helpful, do you have any good idea I should add to it? Please leave me a comment.